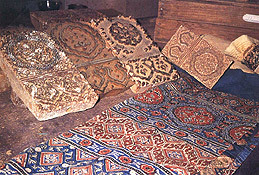 Ajarakh block printing was a very thriving industry before the earthquake. Located around Dhamadka, the workshops suffered massive damage during the earthquake. Among all the crafts this craft needs big workshops and capital investment in blocks and dyeing equipment. Over the years the Khatries has invested their surplus funds in infrastructure like printing sheds, washing units and blocks. Large damage was suffered to them during the earthquake. Also due to change in water quality majority of the units migrated to other villages like Ajarakhpur and Kotda making the remaining infrastructure redundant. This relocation played havoc with the industry and the printers are still struggling to recover fully. Today there are around 125 workshops carrying out this work in over 8 villages. It is imperative that the industry diversify into more value added fabric and produce products of better quality with new designs. Majority of the designs have not changed for decades causing a fatigue in the market place. Small design interventions where one or two ranges are created have been carried out but due to the low scale the impact has been very negligible. An influx of massive number of new design and a resource center where the artisan can look at new designs and buy swatches which he can show to the customer for orders and also use to recreate the design is needed. The higher value will ensure that sufficient surplus will be created which will help in creating better infrastructure.